State representatives from the House Transportation Committee and the House International Trade & Intergovernmental Affairs Committee met in Weslaco at the Knapp Conference Center on Tuesday, March 20, 2018, to discuss border trade improvements. 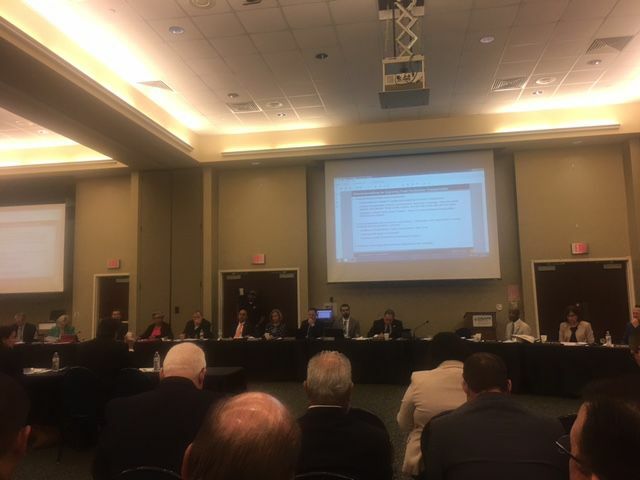 At a joint committee field hearing held Tuesday in Weslaco with members of the Texas House Transportation Committee, and International Trade & Intergovernmental Affairs Committee, the importance of better trade routes via the Texas Southwest border to our regional, state and national economies were highlighted. But most in attendance — especially lawmakers and policy wonks from the Rio Grande Valley — were already well aware of this, as well as the symbiotic economic relationships that U.S. border cities share with Mexico. And so it was especially enlightening when state Rep. Joe Pickett, a Democrat from El Paso, looked around the room and asked why federal officials weren’t also invited to the Knapp Conference Center for Tuesday’s hearing? And then he suggested a great idea: Convene a joint hearing with U.S. congressional and Senate representatives from Texas to talk trade to “get them on the same page.” This might help the state of Texas get access to more federal dollars to help make the necessary infrastructure improvements to our roads, bridges and ports of entry, he said. He’s absolutely right and we hope the chairs of both committees will pursue taking these hearings to a national stage. The timing certainly is right now as international leaders are trying to renegotiate the North American Free Trade Agreement. NAFTA is directly affected by Texas’ international trade corridors, like those in the Rio Grande Valley. Invite NAFTA officials to the RGV and hold international hearings here so diplomats can see firsthand the heavy truck traffic and billions of dollars in commerce that pass through our South Texas ports. There is no doubt our ports need to be improved. Border economists say for every minute that commercial truck traffic is delayed heading northbound from Mexico into the United States costs the U.S. economy $116 million. Part of the problem is that in Texas there are only 14 border crossings for commercial trucks, Caroline Mays, of the Texas Department of Transportation’s Freight & International Trade Section, testified. Trucks often must wait one to four hours to get through various border inspections, officials testified. That translates into spoiled strawberries and other produce that gets passed on to consumers at the grocery stores via higher prices. And it strains international relations. About $66 billion in commercial lane improvements in Texas is needed to move products quicker and more efficiently across our Southwest border. No doubt, assembling the 16 representatives from these two prestigious House committees to meet in the Rio Grande Valley to discuss this issue — ahead of the 86th Legislature, which convenes in January and which will be tasked with trying to fund these projects — was a great idea. Kudos to state Rep. Armando “Mando” Martinez, vice chairman of the Transportation Committee, D-Weslaco, who helped arranged this in his hometown. But Pickett is right: If Texas is expected to expand and improve costly infrastructure in order to increase trade routes to facilitate more commerce into the United States, then more federal dollars need to assist with these projects. Considering that in 2016, the United States traded $524 billion worth of goods with Mexico and economists believe much more cross-trade could occur if trucks weren’t bogged down with multiple security checks and agricultural inspections from various state and federal agencies, our federal officials should gladly get on board. Some suggestions for improving trade corridors include separate lanes for commercial vehicles, and separate routes for empty carriers. Mexican officials apparently already realize the necessity of this and in Tijuana have separate lanes for southbound empty and full carriers, Mays told the representatives.